The jacket seems to be really useful against wind and cold. I would like to test it with less degrees. It look amazing, but I think there are few problems. 3) Inside pocket could be more confortable, but it is just a my opinion. Integrated balaclava, waterproof, windproof, breathable, ergonomic, lightweight and durable. Price, pockets could be a little bit bigger, but it`s a matter of taste. This is a pretty good winter jacket for a reasonable price. It keeps the wind and rain out and keeps me cozy, it's comfortable, and it's got the right number of pockets. It is produced to the highest of standards, from the material all the way to stitching, but what is really important to me, it looks great as a whole. This jacket is just an awesome product! The jacket is warm and good at protecting you against the elements. However it got some big design flaws that i wish i knew before ordering as i rather would have gone with another jacket instead..
First, the collar is way too small, if you zip the jacket all the way up its going to cut into your neck and chin. Using this jacket over a longer period, this will really start to hurt and hinder your head movement. This alone is really bad considering the price point. 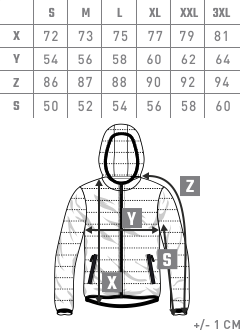 A winterjacket needs to be able to zip all the way up without becoming uncomfortable and becoming an obstacle. Otherwise it could just as well be a summer jacket. Second, the inside material by the wrist is constantly rolling out and over the actual outside of the jacket because of the lack of any wrist retention. This is also not good for a winter jacket as this opens up the wrists for the elements and potential tattoos will show making the sewed in balaclava pretty obsolete. I would like to give the jacket a 5 star as it is warm and good looking but as i have tried overlooking the flaws it is starting to becoming a hassle that i cant ignore. Its pretty disappointing. Great value product. Keeps the cold out, wind proof and shower resistant. Love this jacket. Die Qualität der Jacke ist sehr gut und gibt schön warm, die größe M fält normal aus.